In India, the traditional Hand Made paper Making craft from waste yarn / fibers dates back to mughal-era. India had a thriving hand paper industry dominated by agagazis, a community involved in traditional paper making. Due to introduction of machine made paper, the handmade paper industry took a beating due to price and other modern technical features. We use traditional techniques and use cotton rags as raw material, which does not harm the mother nature. Our unit is located in a peaceful village called Sankheda, in Dist Vadodra of Gujarat state of India. Village Sankheda is surrounded by green farms and forest. Narmada canal and river orsang passes near the village. Our water comes from our own wells, since paper making consumes large quantity of water, effort has been made to conserve water, by recycling the water number of times for paper production. 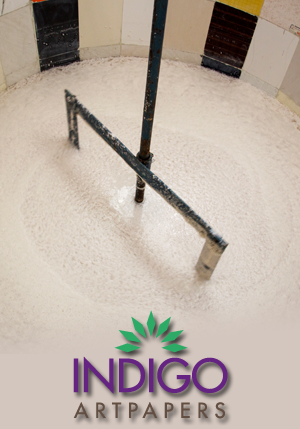 No chlorine, bleaches and harmful chemicals are used in paper making process. The used water is pH neutral and is used for irrigating our garden and vegetable farm. Our village has a bio mass power generation unit which uses the bio mass waste generated in nearby villages to produce 10 Mw of electrical energy. We use the same energy to produce the Indigo Artist Paper. We employ the local village men and women in our paper mill. We strive to be the best employers; we have experienced trainers who train the locals through exhaustive training. We want to give back to the community by employing locals from the community, whoever is in need of work. We have a mission to compete with the best in the world bordering a Go-green attitude which we are proud of. We encourage our clients to visit this peaceful serene place where we call our home. Indigo artpapers paper mill located in village Sankheda, we strive for continuous improvement. We use cotton rags (not wood) to produce archival quality paper products, use bio-mass electrical energy, recycle water used in our process. Talk about being a complete environment friendly process which is self-sustaining, contributing to the improvement of local people, and making effort to produce world class paper to be used by artist across the globe. Come visit us and be a part of our Go-green journey that we are proud of and then support us. Quality: Delivering high quality papers that we are proud off. Innovation: Research to produce high quality papers, with apt integration of advanced environment friendly chemicals with traditional paper manufacturing techniques. Reputation: Build a trust with the artist community around the world and to deliver what we promise. Value: Constantly strive towards continuous improvement and to provide you with the quality you expect while purchasing our product. Go-Green: Complete environment friendly process which is self-sustaining, contributing to the improvement of local people, and making effort to produce world class paper to be used by artist across the globe.